A Mandala Airlines Boeing 737-200 has overshot the runway at Abdul Rachman Saleh Airport, East Java, Indonesia after a domestic flight from Jakarta. Five passengers were injured in the accident, none of them seriously. The aircraft’s nose landing gear is understood to have seperated in the incident, in which the aircraft skidded 260 feet from the end of the runway. Five of the 89 passengers and seven crew on board received cuts and bruises during the emergency evacuation that followed. It was raining heavily at the time, although it is not known if this is considered to have played a factor. The accident is currently under investigation. One potential cause being looked at is the fact that the forward landing gear axle is beleived to have snapped upon landing, setting off the chain of events. The Indonesian aviation industry has been the subject of much criticism this year over safety concerns, sparked by a string of accidents including Adam Air 574, which crashed into the ocean, killing 102, Adam Air Flight 172, a nonfatal accident where a plane snapped in half, and Garuda Indonesia Flight 200, which overshot a runway at extreme speed, killing 21. All Indonesian airlines are on the list of air carriers banned in the EU, and the United States Federal Aviation Administration has downgraded Indonesia to it’s lowest safety rating. 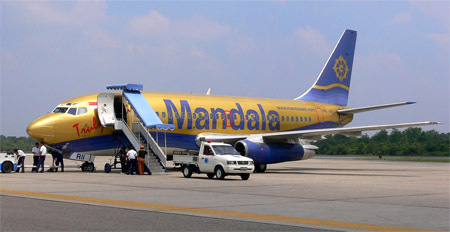 Mandala Airlines was founded in 1967 and attained “First Category” of the Indonesian Aviation Safety Rank October 5, 2007. Their only fatal accident was the crash of Mandala Airlines Flight 091 in 2005, which killed 112 people. They are now under the implementation process of IATA’s Operational Safety Audit (IOSA) expected to finish in March 2008. After it Mandala will be the second airline in Indonesia with IATA certification. Its fleet consist of 10 planes: 4 B737-200s, 2 B737-400s, 1 A319 and 3 A320s. They have order for 25 A320s. Mandala Airlines has grounded its four Boeing 737-200 aircraft after one of them skidded off a runway upon landing, a company official told the Jakarta Post on November 2. “We decided to ground all our four Boeing 737-200s for safety reasons following the incident,” said Mandala’s chief executive officer Warwick Brady. Mandala announced plans to shift its fleet from Boeing to Airbus, and has six Airbus 319 jets in use, according to airline officials.